I was like a child waiting for Christmas for the Sonlight box to arrive. We were away on an errand and when we got home, there it was! The look on Isabel's face was precious. She was shivering with excitement to get that box open! I let her unpack and kept on saying, "Surely that must be it! Are there more!?" 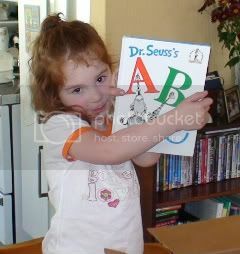 Dr Seuss's ABC book is a favourite and I have to read the whole thing to her about every second day. The other science books also seem to be a hit. I wonder: Could there be a little genius in the making? Of Course!